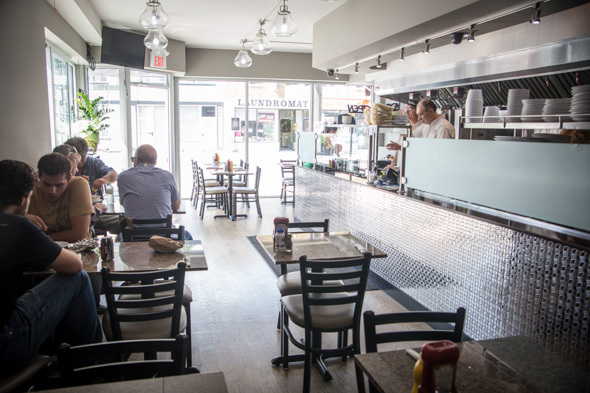 Tzatziki is a sparkling-new family-run diner on Pape, about 500 metres north of the Danforth. Off the main drag and only in its third week, I'm surprised to find, when I arrive at lunch hour, that the place is really busy. 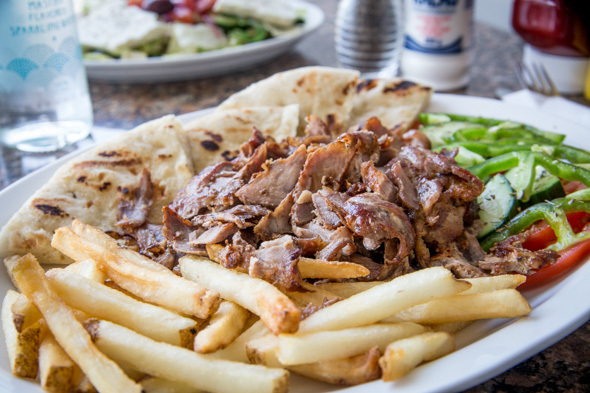 A steady stream of Greek-speaking diners order pita wraps directly from the silver-haired gentlemen at the grill before grabbing seats and letting the waitresses take care of them. Most carry in espressos from Macchiato, the adjacent (they share washrooms) espresso bar from the same owners. I'm pretty sure we're the only ones not speaking Greek, though the grill guys behind the counter seem happy enough to chat us up. "Do you you know what Greeks are famous for besides gyros?" asks one grill man as he gently shaves meat off the rotisserie spit. "Ouzo?" is my guess. "That too, but also our hospitality." I like this guy - I don't catch his name, but I can't help but agree. This is a no-frills kind of diner. It's clad in stainless steel and furnished for utility more than decor, and even still, this place radiates a lot of warmth. The menu covers much of what you'd expect from any Greek diner, and then some. 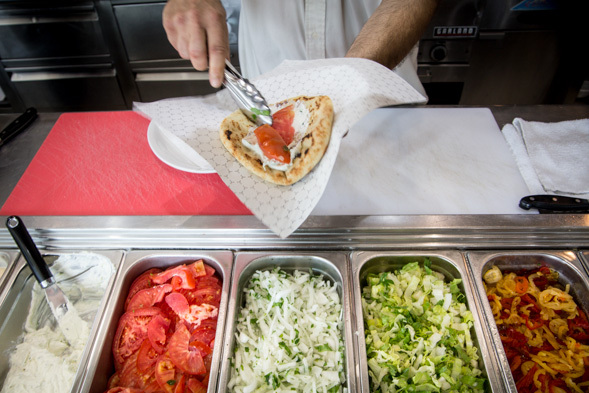 Chicken and pork gyro are on offer, wrapped with chopped vegetables in tzatziki-slathered pita ($6-$7), or on a platter ($11-$14) with a choice of two sides. The pita is puffy, lightly grilled, and despite counting towards my two sides, it's totally worthwhile. Next time I'd skip the fries and opt instead for green beans. Roast potatoes and rice is an option, too, for those who deem it essential - I'm just not one of them, and I'm glad to not have it forced on me. I'd typically leave it to waste anyway. They're generous here with the signature house tzatziki, slathering it over pita or doling it out in big dollops on side plates with the full dinner. It's thick, sharply garlicky and studded with julienned cucumbers. 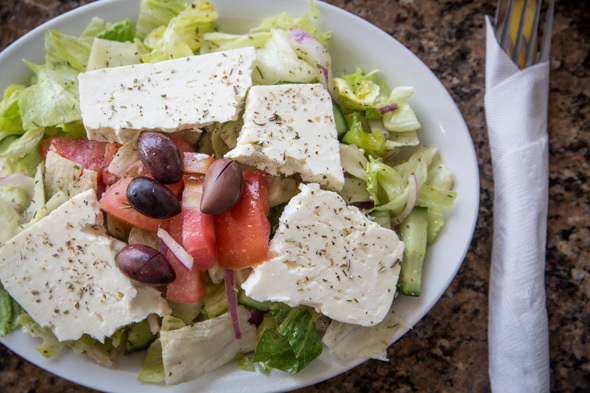 The Greek salad ($7/$9) is built on a bed of pale green lettuce, dressed first in olive oil and oregano, then topped with a colourful mix of cucumbers, tomatoes, red onions and kalamata olives. A brick of feta crowns the whole thing, and another liberal application of olive oil and oregano finishes it off. It's not exactly an authentic dish, but it's still really tasty, and in my defence, I just followed the lead of the locals - none of whom even looked at a menu. Had I studied it before ordering, I woud have discovered that the menu does, in fact, list plenty of traditional dishes. Rustic Horiatiki village salads ($8/$10) and a full range of hot and cold mezedes are represented - everything from horta (wilted rapini and endive, $6) to tarma (fish roe dip, $5) and saganaki (fried cheese, $11). Tzatziki opens daily at 11:30am, and the intent (at least for now) is to stay open nightly until 2am if not later. 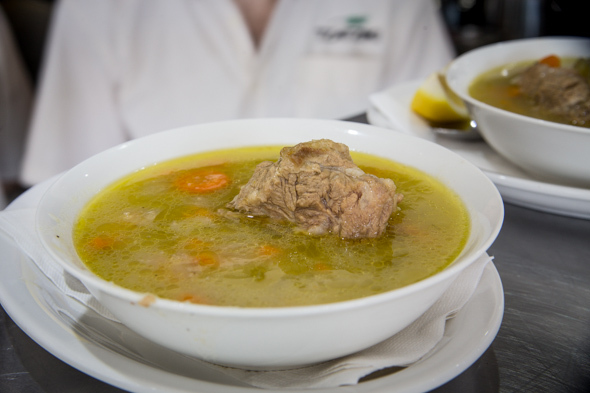 We're not talking weekends only, either - they're planning to serve late-night eats week-round.